Arthroscopy is a way to find problems and do surgery inside a joint without making a large cut (incision). Your doctor puts a lighted tube with a tiny camera and surgical tools through small incisions in your knee. The camera is called an arthroscope, or scope. Remove or repair a torn piece of cartilage or loose bone. 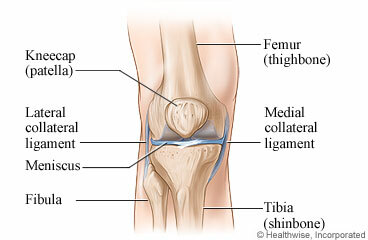 Replace a torn anterior cruciate ligament (ACL) tear with a piece of tissue. This repair is called a graft. Most people go home on the day of the surgery or the next day. If you have a simple injury, it may at least 6 weeks to recover. It may take longer if your doctor had to repair damaged tissue. You will need to limit activity while your knee heals. You may need to have physiotherapy (rehab) to help your knee get stronger. If you have a desk job, you may be able to go back to work a few days after treatment of a simple injury. If you lift things or stand or walk a lot at work, it may be 2 to 6 weeks before you can go back. After surgery and rehab, you will probably have less pain. Your knee should be stronger. You should be able to use your knee and leg better. Some people have to avoid lifting heavy objects. The surgery will take about 1 to 2 hours. It depends on how much repair needs to be done to your knee. Enter I038 in the search box to learn more about "Knee Arthroscopy: Before Your Surgery".